Donald Gets Drafted is released. It is the first of many cartoon shorts featuring Donald that were released during World War II. Donald's impact during WWII was huge, in fact it is worthy of it's own post. Be watching for one soon. 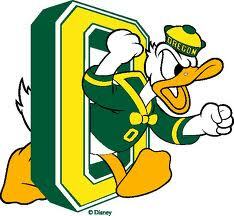 Walt Disney Productions grants the University of Oregon the rights to use Donald Duck as their official Mascot. Following Walt's death in 1966, it became known that there was no written contract allowing the university the rights to use Donald's image. This was corrected in 1973, when a contracts was signed by the two parties. 1984 was a big year for Donald, he turned 50 and became an honorary alumnus of the University of Oregon. His full name is Donald Fauntleroy Duck. 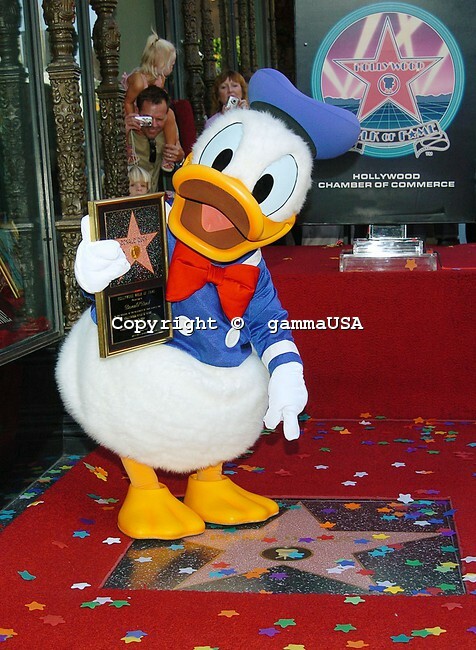 He has a star on the Hollywood Walk of Fame (2004). His footprints can be found in front of Grauman's Chinese Theater (1984). His first film The Little Wise Hen was released on June 9, 1934. In the 1940's Donald was more popular than Mickey Mouse. Donald came to be when Walt overheard Clarence "Ducky" Nash reciting Mary Had A Little Lamb using his duck voice. Clarence was the voice of Donald from 1934 to 1983, he personally coached Tony Anselmo to take his place. Here in the states we know Donald for his work in cartoons, in Europe he is famous for his comic books. Donald's cartoon short - Der Feuhrer's Face - won an Academy Award in 1942. We love Donald Duck, in fact he's Dakota's favorite!! Awesome info, I always learn something, like Donald's middle name.